The park is home to several large predator species, including lion. An area of stark contrasts with two very distinct seasons, Zakouma is a refuge for elephant and numerous other species, many of which are threatened elsewhere within this eco-zone. Zakouma is characterised by two seasons: wet and dry. The wet season runs between June and November, wherein the park receives an average of 850 millimetres of rain. This results in much of the terrain being completely inundated with water and some species migrating outside of its boundaries. The dry season then lures wildlife back to the eastern half of the park, where pans and fertile floodplains provide plentiful drinking water and grazing. Large herds of animals and thousands of birds congregate at these pools from February to June, making for spectacular game viewing. Black crowned crane is found in flocks of thousands. The flora of Zakouma forms part of the Sudano-Sahelian vegetation zone and is mainly characterised by Combretum or Acacia savannah and grasslands, which are important for the grazers as the rest of the habitats dry out. Sections of gallery forests and floodplain depressions or pans are also common in the east. Inselbergs (granite domes) are a characteristic feature of the south-western area. Prominent tree species in the Combretum savannah include the paperbark thorn, the white thorn and the axlewood tree. The Acacia savannah is characterised by species such as the red acacia (also known as the shittah tree), the scented thorn, the desert date, the axlewood tree, the jujube and Combretum glutinosum. Zakouma serves as sanctuary for West and Central African biodiversity, due to its year-round availability of water. Notable species include the Kordofan giraffe, with 50 percent of the African population residing within the park. Some 66 mammal species are found in the park, of which 16 are large mammals. The buffalo population now numbers over 10,000 individuals. Larger species include lion, leopard, cheetah, spotted hyaena, striped hyaena and wild dog, while smaller species include civet, serval, caracal, jackal, honey badger, African wildcat and the pale fox. Some of the most notable species include elephant, Kordofan giraffe, Central African Savannah buffalo, Western greater kudu, red-fronted gazelle, Lelwel’s hartebeest, tiang, roan antelope, Defassa waterbuck, Buffon’s kob, warthog, red-flanked and Grimm’s duiker, oribi and Bohor reedbuck. Three species of primate are found in the park, namely the olive baboon, patas monkey and tantalus monkey. 388 bird species found in the park, including red-throated bee-eater. Zakouma’s floodplains, rivers, marshes and pans are a valuable stop-over and breeding ground for birds, and the south-eastern wetlands form part of the RAMSAR site “Inundation Plains of Bahr Auok and Salamat” – one of the largest in the world. Some 40 raptor species are found in the park, along with abundant populations of northern carmine bee-eaters and red-billed queleas. Zakouma is also home to the Abyssinian ground hornbill. The park’s elephant population is on the rise. The park is an important refuge for numerous animals, many of which are threatened elsewhere within this eco-zone, which stretches as a band across the breadth of Africa to the south of the Sahara Desert. Prior to 2011, Zakouma’s iconic free-ranging elephant population was almost decimated by rampant poaching, plummeting from 4,000 in 2002 to just 450 in 2010. However, within two years of African Parks taking over management of the park, elephant poaching was completely halted in the ecosystem and a programme to protect elephant across a 15 000 km² zone, which includes protection during the wet season, has been implemented. Today the elephant population of Zakouma is on the rise for the first time in a decade, with more than 500 individuals counted in 2018, 81 of which were under the age of three. In terms of avian species, Zakouma is believed to be home to the largest population of red-necked or North African ostrich, now extinct in most of its former range. The black-crowned crane is found in flocks of thousands and it is believed that the ecosystem is key to the survival of this species due to habitat loss in many areas. The black-breasted barbet is also found in Zakouma, a species of very limited range in Chad, CAR and Sudan, making the park the only place where it can be viewed by tourists. Overall, the ecosystem is healthy, however two large mammal species are now extinct in the area, namely the western black rhino and Lord Derby’s eland. The black rhino, once abundant, went extinct in Zakouma in 1972, while the Lord Derby’s eland disappeared in the mid-1980s. It is the intention of park management to try and reintroduce these two species to restore the ecological integrity of the park. The hippopotamus has also not been seen in Zakouma for many years, but it is possible that they will return one day from Lac Iro. Since African Park’s involvement, most species of larger mammals, including buffalo, giraffe, roan antelope and Lelwel’s hartebeest have increased in number. The buffalo population, reduced to only about 220 animals in 1986, has increased to over 10,000 today. Zakouma has tagged elephants in each of the park’s herds, fitting them with satellite GPS collars in order to gather more information on their movements during both the wet and the dry season. Each satellite collar transmits location data every four to eight hours, enabling management to follow the elephant movements closely. 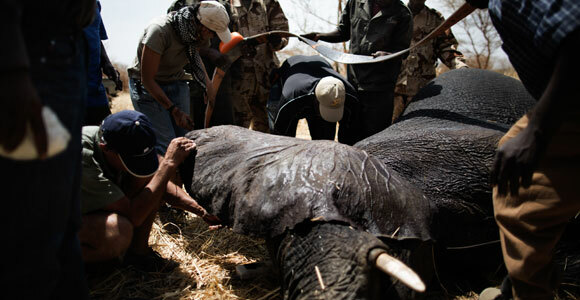 This initiative was so successful, that African Parks, together with the Government of Chad, launched a nationwide programme to tag between one and three individuals in each of the country’s primary elephant populations, and feed this vital data through to a National Centre for Elephant Protection in N’Djaména, which is currently managed by African Parks under the auspices of the Chadian Ministry of Agriculture and Environment. Here it is consolidated and analysed, and will be used to devise the anti-poaching strategy for the region. African Parks has also been instrumental in the preparation of the National Elephant Conservation and Management Strategy for Chad.